I intended to write a post about Memorial Day…and I may still, but I got side tracked (which I often do), to the wonderful world of GroVia. We traveled for Memorial Day. We were going to my parents’ house 3 hours away. No biggie, but I wanted to bring my cloth diapers with me. Packing pockets can be a bit bulky and I was looking for something a bit lighter that could be used more than once. I dug through my “I’ve used these but they aren’t in rotation” bin and found four GroVia shells, 4 soakers, and some fleece liners, and a few of the disposable inserts, and some non-GroVia bamboo doublers. I thought it could get us through the three days we’d be gone, and a quick wash on the middle day, fingers crossed we have no ‘poosplosions’! I hadn’t been using my GroVia’s previously for a variety of reasons. Mainly my babysitter prefers pockets so she doesn’t have to layer the shell, soaker, and fleece each time. I work during the week and I need to have everything prepped for her each day unless I want to come home to find the lil’ guy in disposables. Pockets are easier for this since I just wash, stuff, and stack them. 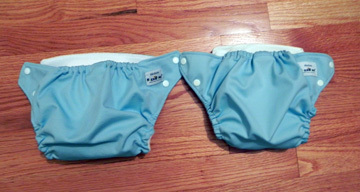 However, when I started this cloth diaper thing, I swore I LOVED the All-In-Two/Hybrid concept and wanted to go with it. Not only because I think it’s a bit ‘airier’ on the bum, but I also like that I have needed less of everything in my rotation. Less shells because I can reuse them if they aren’t wet or poo’d on, less wash because I don’t have to wash 14 diapers every other day, it’s just less. So I dug them out and thought “perfect for travel”. It will keep his bum fresher in the car seat, have less bulk and while we’re driving I can just toss the poopy diapers away rather than store them in the 100+ degree car each time. He spent the weekend in GroVia’s, and I LOVED it. GroVia offers a variety of products, their slogan “A diaper for every family™”. 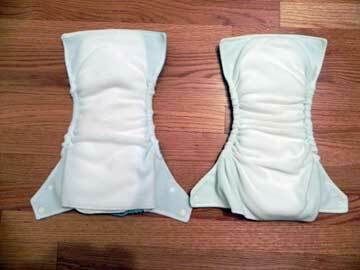 They offer Cloth, Hybrid, and Bio Diapers and Bio Soakers, you can see them all on their products page. 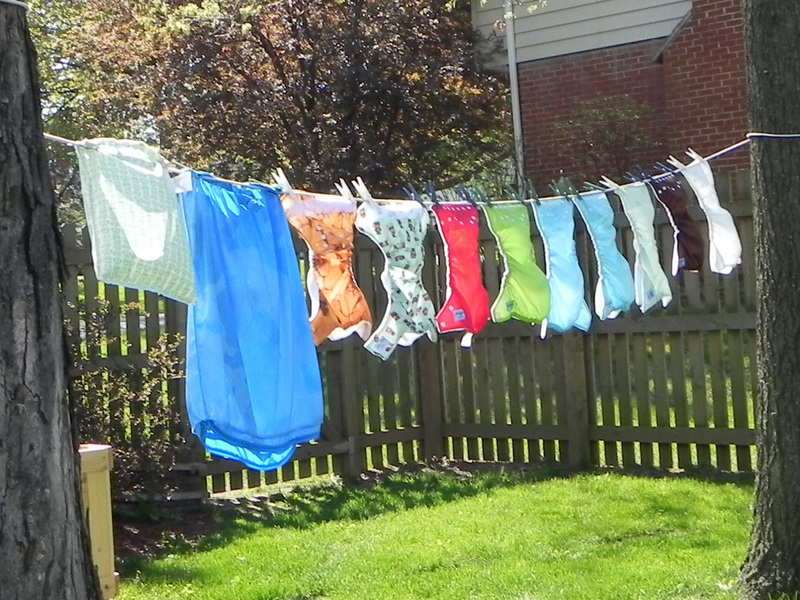 They have All-in-one diapers in newborn and one size, all-in-two diapers with cloth soakers and the option of a Bio Soaker, and a Bio Diaper (which I haven’t seen personally but is on their website). In addition if you scroll down on their page you can see all the other diaper accessories they offer. For starters, the shell it’s self comes in some ADORABLE prints and bright colors. The tabs on the aplix are nice. They aren’t large hooks and loops but rather a soft material that is super flat and smooth. It holds like no tomorrow! 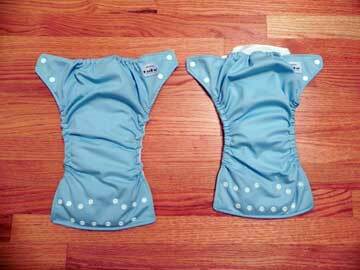 They have “tuck under laundry tabs” so when you wash you can tuck the tabs in and they STAY there through the wash. It’s really nice and eliminates the diaper chains. I LOVE THIS. I HATE diaper chains. They also have front snaps that allows for a great custom fit over time. The shell grows with the baby. Less to buy overall! 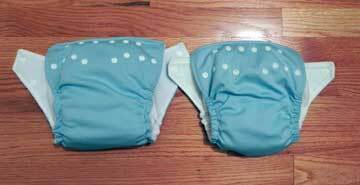 The inside of the diaper is a cloth mesh; it’s super soft and breathable for the bum! I swear the shell helps keeps lil’ man cooler on hot days, no shorts needed! There are snaps on the mesh that allow the cloth soaker to be snapped into place. This is fantastic because the soaker doesn’t shift around when he moves. He can twist and turn, but the shell and soaker are ‘one’ together which is nice. In other shells, I’ve had the problem of the soaker/prefold shifting as lil’ guy moves around or is carried. The soaker its self is nice. It has gussets which I swear help contain ‘poosplosions,’ and is soft. 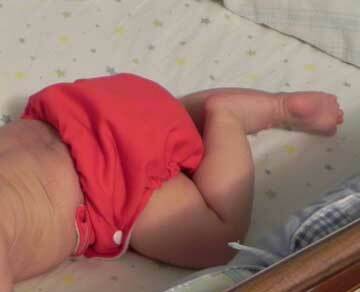 It isn’t however, ‘wet proof’ so if you don’t use a fleece liner over it, baby can feel the wetness of the cloth. The soaker has a waterproof backing which I think helps contain the pee along with the shell. In addition, I like that the area between the legs is narrow, behind the bum it’s wider, and the front is just right (though on the smallest shell setting you have to tuck the front in a bit). It allows lil’guy to keep his legs closer together, which I like, though I’m not sure he notices the difference. The legs also are cut higher so his thighs can ‘hang out.’ I like this because he tends to get dry patches where other diapers rub on the thigh. After doing the suggested prewashes, the diaper has managed to contain his super pees. He hasn’t peed through this diaper yet. If I know it’s going to be a while (3 hours) before I can change him again I add in a bamboo doubler. GroVia doesn’t make bamboo products yes, but fingers crossed they offer something in bamboo soon. They do however, offer a Organic Cotton Booster. As for the Bio Soaker option, I LOVE it. While we were out and about I was able to change his diaper and throw it away eliminating the need to store dirty diapers in a car that was very, very hot. [dirty diaper + hot car = stinky car ride!] The Bio Soaker just sticks into the shell. I think it was a bit stickier than needed as it left a bit of ‘goo’ on the snaps, but with a little rub after a rinse it came off. The Bio Soaker has gussets that contained his messes. They absorbed really well and when he pooped, we had no leaks and I could reuse the shell. I hope to add a few more inserts and shells to my stash over the summer with the Gro-To-Go sale. I think these will be great for the park and zoo trips! Buy it, buy it, buy it. They have a summer sale going on called Gro-To-Go. For $49.99 you can get their summer kit which includes three shells, 50 Bio Soakers and 3 packets of Tiny Bubbles detergent. A $22.00 savings (So you basically get a shell for free). ** I purchased my GroVia’s. I wasn’t asked or given anything to write this review.